Ollie is considered one of the world's leading train enthusiasts. The backyard of his home boasts one of the finest hand built miniature railroads in existence. purchased in 1965. He restored it in his drive way over a period of two years. He and Marie purchased forty acres of land in Julian, Ca where he and his sons laid three quarters of a mile of track. Ollie added a fourteen foot, four wheel caboose patterned after one he had seen in Colorado. He also built a flat car which could hold close to twenty passengers. Ollie’s Hobby was working on railroads... and he had several. He first built a backyard “live steamer” railroad, which he built himself, complete with bridges and trestles. His neighbor, (Frank Thomas) recounted the tale that while he was building his backyard railroad, he was visited by Walt himself, who was planning his own backyard railroad. Ollie was busy digging the ground on his Flintridge property, making sure that the track was perfectly level. Ollie had already “worn out” one heavy duty pick ax, as there was a reason why they called the area “Flintridge” . Click the image above to see Ollie's backyard train. Click on the image on the right to view the Disney Family Album program, dedicated to Ollie’s biography. 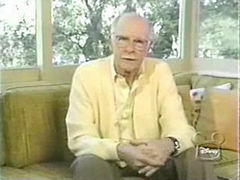 Ollie was an animator who added the “heart” in Disney features. Ollie would tell how the story people wanted to show Bambi’s mother being shot, with her falling down with a gunshot wound. Ollie felt this was too gruesome, and instead, created the scene as it now exists. The biography shows the great characters he indelibly created.